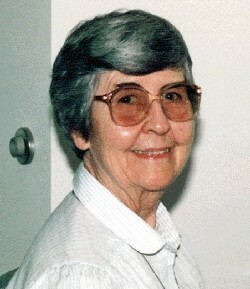 Sr Carmen St. Pierre was born in Lawrence, MA, August 17, 1917, the daughter of the late Valmore and Amanda St. Pierre. She has three living sisters and one brother. 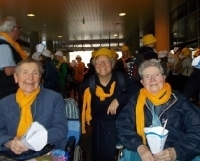 Two of her sisters live in California as well as her brother Emile. Her youngest sister, Pauline lives in Lawrence, MA. Many nephews, nieces, cousins and friends survive her as well as her Marist Missionary Sisters. Sister brought joy, laughter and song with an extraordinary gift of Mary’s presence wherever she was missioned and loved by all. Her beautiful voice will indeed be remembered by all who knew her. 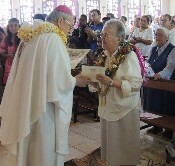 She worked as a secretary in the business world for 10 years before she entered the Marist Missionary Sisters on February 11, 1947. 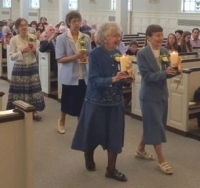 Then followed a remarkable history of availability and willingness to serve wherever she was asked to go and to do whatever she could to be of service to the Congregation. Immediately after profession, she was named Assistant Novice Mistress in Bedford, MA. 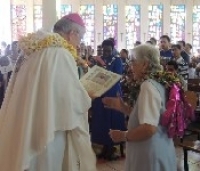 In 1950 she was missioned to Bougainville Island where she taught school for one year and then was named Novice Mistress for the Sisters of Nazareth, (the local Sisters) in Chabai, until 1959. 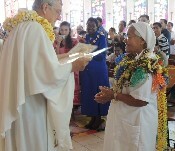 She left for her Home Visit and Second Novitiate and returned to Bougainville and continued to teach in the school at Hantoa. From 1961-1963, she was named Regional Superior. She left for our General Chapter in Rome in 1963 and was elected to the General Council. Finishing her service on the General Council in 1971 she continued on as Local Superior at the Generalate, for another year. She once again returned to Bougainville in 1973 and gave community service as well as being the Bishop’s Secretary until 1990. 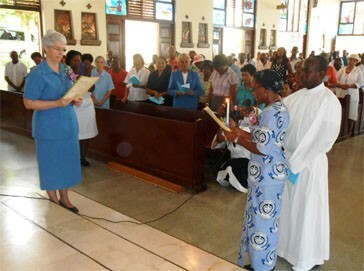 She was absent at various times for home leave, service as a translator at the Enlarged General Council meeting held in Sydney in 1973 and to assist in the preparation for the General Chapter of 1980. Between 1986 and 1990 she wrote the history of the Congregation of the Sisters of Nazareth. Sr Carmen died peacefully on Sept.13, 2007 at Maristhill with the Sisters at her side, and she left this earth, her final home and mission, to be with her God, with a smile on her face. She will always be remembered for her generosity and incredible understanding of people and as a Sister who was ever available to do God’s Will with joy, a Marist who found nothing too hard to do for her God. May she rest in peace.